I don’t know about you, but how I rate myself in the “mom department” varies greatly day by day, minute by minute. A wave of feeling pretty awesome can be quickly followed by feelings of failure. 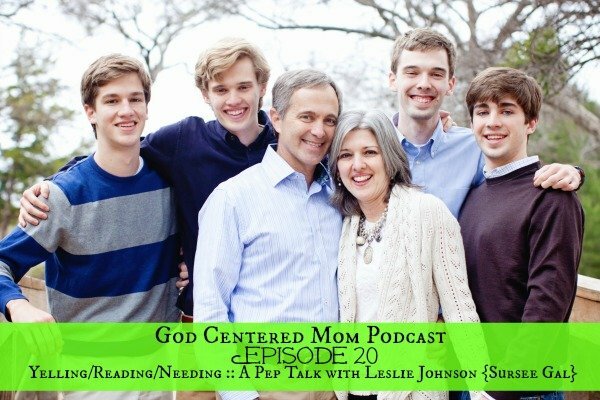 When I’m at a low point, it is nice to call a mom with older children and get encouragement, perspective and wisdom. Because sometimes my feelings are based on a true problem and I need a little guidance on how to approach my boys differently. Sometimes my feelings are based on lies and I need a little truth-telling to get my eyes refocused. For today’s podcast I’ve invited Leslie Johnson (SurseeGal.com) back for a group pep talk. Leslie is the lovely mom to four grown boys. She speaks life and truth. I’m so thankful for her consistent investment in my mothering. I wanted y’all to listen in on one of our typical conversations. Get a taste of what a phone call would sound like (except in this case we know you are listening and may even refer to you as “listeners”…besides that). And just like a real phone call with Leslie, I’m all over the board asking a variety of questions. (after our talk about Dover coloring books, I realized I’ve bought lots of these from Whole Earth Provision. I’m sure they are at your local book store. Or click the link and check some out on Amazon). by Elizabeth Enright (we’ve read The Saturdays by E. Enright & it was wonderful!). *If reading via email, click to blog post to get book links (amazon affiliate). **For those of you who struggle with anger/yelling and want to focus on getting it under control, the MOB Society just launched a new private FB group called “No More Angry MOB”. It’s a place for moms to gather and know they are not alone and for strategies to change habits, be encouraged, etc. Within the first 24 hours of launching, 1,000 moms had signed up. You are not alone. You can find me there! If you could talk to Leslie on the phone, what would you ask her? (may even be used on a future podcast. . . wink wink). Catching up on podcasts I missed and just listened to this one. O, Heather, thank YOU for asking the tough questions – especially about losing your temper – and receiving the good answers. Even as a new mom (way new, my little girl is 4 months old!) I notice my temper flaring at times. Leslie’s wisdom is so uplifting. One thing I know for sure, though, is that anytime we sin there is something, some truth, about God that we aren’t believing. I’ll be praying that we both continue to key-in on what that is so we can remind ourselves of God’s truth and not believe Satan’s lies. There is so much grace through Christ for us all! When God looks at us, praise His name that He sees the perfect life of His son and not our imperfect ones. Thank YOU Victoria for your reminder to stay fixed on truth. Congrats on the new baby girl! So glad to hear you are enjoying the podcasts. I’m loving recording them and learning from each guest. blessings.